The first page of the book was appropriately titled Learn to Knit. The first column of the first page talked about equipment needed in terms of the different types of needles such as standard knitting needles, circular and double-pointed needles, and cable needles as well as different types, thicknesses, compositions, and twists and textures of yarn. Right off the bat, the book contained a lot of terms of which I have no knowledge or that were confusing to me. For example, I have fished all of my life, but I have no idea what a fishing sweater is. And the book saying that a fishing sweater is like a circular shawl doesn’t unmuddy the water. And what is a cable? I suppose that will come up later. I am not embarrassed to admit it, but the term that I struggled with the most was stitch. What exactly is a stitch? Is it the loop? Is it the loop and something else? I have never knitted before. Should I magically know what a stitch is? I am sure this beginner’s book makes sense to someone who already knows how to knit, but I got to tell you, whoever wrote this, copy edited this, and published this might want to fetch a dictionary and look up the word beginner because they obviously don’t know what a beginner is. Just saying. Step 1. Wind the yarn around two fingers and over the two fingers again to the back of the first thread. Step 2. 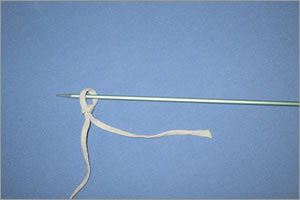 Using a knitting needle, pull the back thread through the front one to form a loop. Step 3. Pull end to tighten the loop. I don’t know where to begin. There are so many problems with these instructions and this picture. Let’s start with the instructions. Step 1: Wind the yarn around two fingers and over the two fingers again. How many loops is this? Two or three? And does it matter where the winding and looping of the yarn falls on the fingers? Step 2: Using a knitting needle, pull the back thread through the front one to form a loop. From what reference point are we talking about? Where is the front of the loop and where is the back of the loop? To me, it looks more like a matter of the right side and left side of the loops. Step 3: Pull end to tighten the loop. What is end? 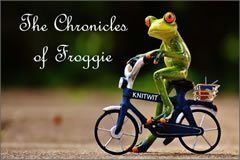 Is it the end of the yarn? Is it the end of the loop that I am pulling on? Now, look at the illustration, the picture of the hand and the way the fingers are holding the yarn. It appears to me that the back two fingers, pinky finger and ring finger, are holding the yarn, the thumb and forefinger are also holding the yarn, and the yarn is wrapped twice around the top of the forefinger and middle finger. This is problematic for me as I have never held any kind of yarn or string in my back two fingers and I can’t get my back two fingers to close and hold the yarn. And as my middle finger can’t bend on account of it being broken twice in football injuries during my youth, it looks like I am flipping myself the bird as I am trying in vain to make this slip knot. How apropos. At this point my avid knitter wife suggested that I make the slip knot another way and she showed me how she does it, not using a needle, but just with her bare fingers. I told her, and showed her, that I can do that way too. That is, make a slip knot with my bare fingers. 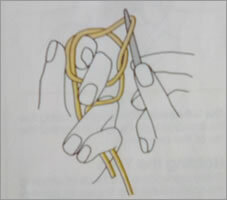 But what I can’t do is to make a slip knot using a knitting needle like the way the book shows and explains. When my wife suggested that I just not bother with how the book says to make a slip knot, but to just do it and get on with learning to knit, we got into a little bit of an argument. 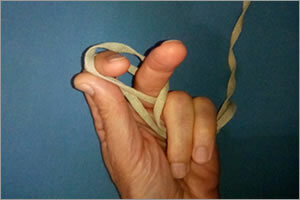 To me, the point is not just to make the slip knot, but to be able to read and comprehend the instructions, understand what I am seeing in the illustration, and to develop, if not master, the skill of making the slip knot the way the books says to make it. If I can’t get beyond the first page of the Knitting Made Easy book without failing to accomplish the easiest of tasks, then what hope do I have with the remaining pages of the book, instructions, diagrams, patterns, and yes, learning to knit. What about that is hard to understand? Having lovingly explained my thinking to my avid knitter wife, she displayed a chagrin, made her annoyance with me quite obvious, and said I was being obtuse. This was not the first time in our long lasting marriage that she has called me obtuse and not once has it been meant as a compliment. Well, I must say – yes, when it comes to knitting, you can call me unskilled. You can call me ignorant. You can even call me stupid and I don’t mind one bit at all. But to call me obtuse and to give me that spousal look? And for what? Because I want to understand and do what is in the Coats & Clark Knitting Made Easy book? By the way, is not Coats & Clark a highly reputable firm in good standing? Is there a reason why I should not value or follow what they say in their books? I thought not. I suppose one person’s obtuseness is another person’s dedication. Anyway, I can now make a slip knot using a knitting needle. Furthermore, through all of this trial and error learning and thinking about what the instructions and illustration were attempting to convey, I now understand everything that I read and saw on page one of my Knitting Made Easy book. To knot, or not to knot? I chose to knot.